Secretary of Energy Rick Perry (left) speaks with West Virginia's senior senator, Democrat Joe Manchin, during a visit to the Longview Power Plant in Maidsville, W.Va., last week. Lordy, how the mean girls jeered when Energy Secretary Rick Perry offered some extemporaneous words of encouragement to workers at a coal-fired power plant in West Virginia last week. "Here's a little economics lesson," Perry said in response to a question about how the coal industry can stay competitive when the shale revolution of the last 10 years has made the supply of natural gas so abundant and cheap. "Supply and demand: You put the supply out there, and the demand will follow." Cue an avalanche of media scorn. "Rick Perry Hilariously Misunderstands Supply and Demand Theory in Attempted Defense of Coal Industry," guffawed Newsweek, deriding Perry for not grasping an economic fact so simple that "even the vast majority of people who have never stepped foot inside an economics class" understand it. On MSNBC, Chris Hayes aired a story on Perry's remarks that led off with video clips of Donald Trump insulting Perry's intelligence. Time posted some of the mocking tweets that proliferated in response to Perry's words, including one with a link to his college transcript, showing the D he earned in an Economics class at Texas A&M 47 years ago. Far be it from me to infringe any journalist's right to pour contempt on Perry's head. But it might be worth mentioning that before he became energy secretary, Perry spent 14 years as governor of Texas and presided over an incredible economic boom. On Perry's watch, Texas - driven by surging growth in oil and gas production - generated more than 30 percent of all new American jobs, and did more than any other state to lead the US out of the Great Recession. True, he did once say "oops" in a debate. But perhaps Perry isn't quite as clueless about supply, demand, and the energy sector as all the media hilarity suggested? Perry wasn't in West Virginia to teach a seminar in supply and demand theory. He was there to lead a bipartisan delegation through one of the most efficient coal-fueled electricity plants in the nation. The Longview Power Plant, just six years old, is a cutting-edge example of "clean coal" technology, built to generate electricity with greater efficiency and lower emissions than older plants. For the first time ever, more electricity was generated in the United States last year from natural gas than from coal. The coal industry has been struggling for years, beset not only by environmental concerns but also by merciless price competition from natural gas. In a market upheaval that no one would have predicted even a decade ago, the United States has become the world's foremost producer of natural gas. 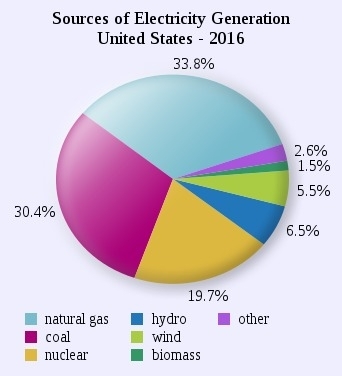 Recently coal was knocked from its perch as the dominant source of fuel for electric power; in 2016, for the first time ever, more electricity was generated from natural gas (33.8 percent) than from coal (30.4 percent). Between the rise of natural gas, the political support for renewable energy, and the closing of older coal plants, many have assumed that the death of the coal industry is inevitable. But reports of coal's demise may be premature. "The improbable happens regularly when it comes to energy," writes economist Mark J. Perry, a scholar at the American Enterprise Institute (and no relation to Rick Perry). Just as the new technologies of fracking and horizontal drilling unexpectedly made it profitable to extract oil and gas from shale deposits, so too the newest clean-coal technologies, some still in their infancy, "could upend perceptions about coal's environmental impact." In other words, those at work in the coal industry shouldn't give up on themselves: That was the context of Secretary Perry's visit to West Virginia. And that was the point he was making when asked how coal can hope to contend with the price advantages of shale gas. His answer - "put the supply out there, and the demand will follow" - wasn't intended as a microeconomics tutorial. It was intended to hearten workers at the leading edge of clean-coal power generation. Perry wasn't implying that no matter how much coal the industry produces, there will always be a demand for it. He was expressing confidence in the continuing ability of coal to compete in the energy marketplace, despite all the ways in which that marketplace is changing. When so many Americans depend on coal for their livelihood and their lights, is that really a message anyone should laugh at?